Monitors the tire pressure while you are driving. If your vehicle’s tire pressure becomes significantly low, the low tire pressure/TPMS indicator comes on and a message appears on the multi-information display. 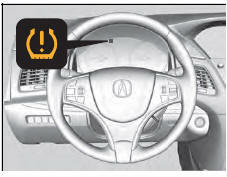 The low tire pressure/TPMS indicator will not come on as a result of over inflation. To select the tire pressure monitor, set the power mode to ON, and roll the right selector wheel until you see the tire pressure screen. 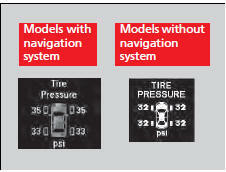 The pressure for each tire is displayed in PSI (U.S.) or kPa (Canada). is displayed when a tire has significantly low pressure. The specific tire is displayed on the screen. The pressure displayed on the multi-information display can be slightly different from the actual pressure as measured by a gauge. 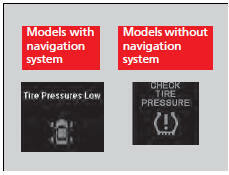 If there is a significant difference between the two values, or if the low tire pressure/TPMS indicator and the message on the multi-information display do not go off after you have inflated the tire to the specified pressure, have the system checked by a dealer. Tire Pressure Monitor Problem/CHECK TPMS SYSTEM may appear if you drive with the compact spare tire*, or there is a problem with the TPMS.